This year 2017, Zain Bahrain bring new prepaid mobile packages while old social media packages are no more available. New packages costing price BD 1.5 per week or else 6 BD per month. There is promotion going on the new prepaid packages which will be valid til 31st January, 2017. Zain Bahrain is offering extra then the regular packages till end of March 2017. 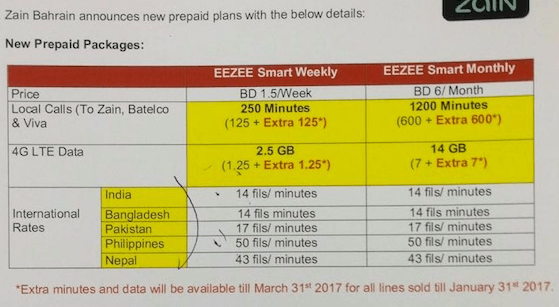 Main purpose to launch these new packages is to stop offering international free minutes & collect more payment from the telecos users. We believe that by the year 2017, Batelco & Viva will have their new packages introduced soon.